It is almost more important that the computer goes into the sleep mode, than that the standby state is prevented in Windows by Don't Sleep! This new feature is in don't sleep from version 4.01! Wouldn't know how big is the damage worldwide through pointless running computer. I think there are millions per day. 1.) ... The solution for the sleep problem under windows! 2.) ... Auto switch for system power options (from version 4.81)! 3.) ... Detect Xbox Controller and / or Joystick events (from Version 4.93)! 4.) ... Mouse-Tolerance from Ver. 5.11 in Please Sleep Mode! 1.) The solution for the sleep problem under windows! Please use always ... the latest version of : Don't Sleep! See also: ►TV sleep function with Please Sleep ► How do I get rid of Don't Sleep? (Image-1) Please Sleep Feature in Dont-Sleep on Wndows-10! 2.) Auto switch for system power options! With this tool allows you to benefit from the advantages of different energy modes. ► .... How can i use the Auto Power Options OK for Windows OS! 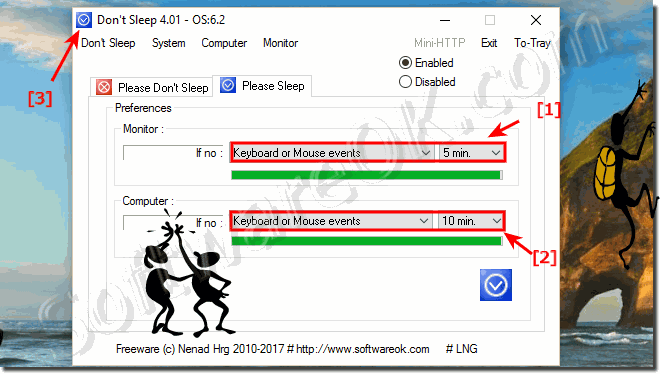 Here in the example, as long as no keyboard input and no mouse action takes place and that for 10 seconds, the PC is in the most economical and most gentle energy saving mode, at mouse or keyboard events, the auto energy mode is switched to the balanced energy plan. The time is adjustable in the program from 10 seconds to 5 minutes. (Image-2) Auto Power Options Switcher! 3.) 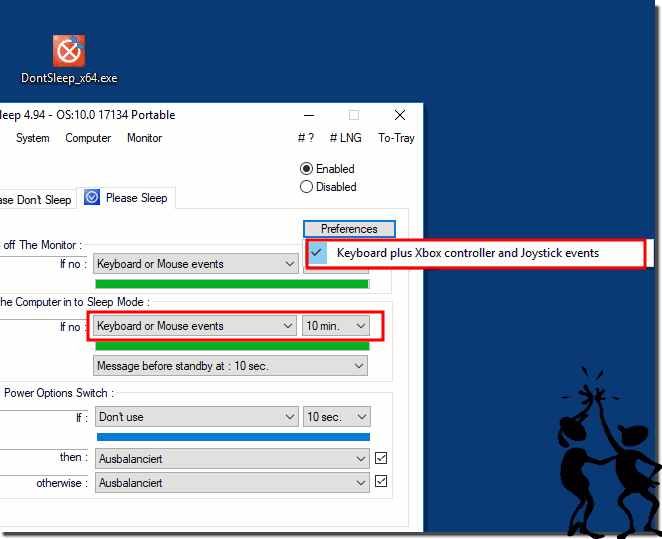 Detect Xbox Controller and / or Joystick events (from Version 4.93)! From version Don't Sleep 4.94 in "Please Sleep Mode" enables the possibility if activate Keyboard Events to detect Xbox Controller and / or Joystick Events, so the Keyboard Events setting includes the Xbox One, Xbox 360 Controller, and other joystick events! (Image-3) watch Xbox Controller an Joystick Events! 4.) Mouse-Tolerance from Ver. 5.11 in Please Sleep Mode! (Image-4) Mouse-Sensitivity-Tolerance in Please Sleep Mode! 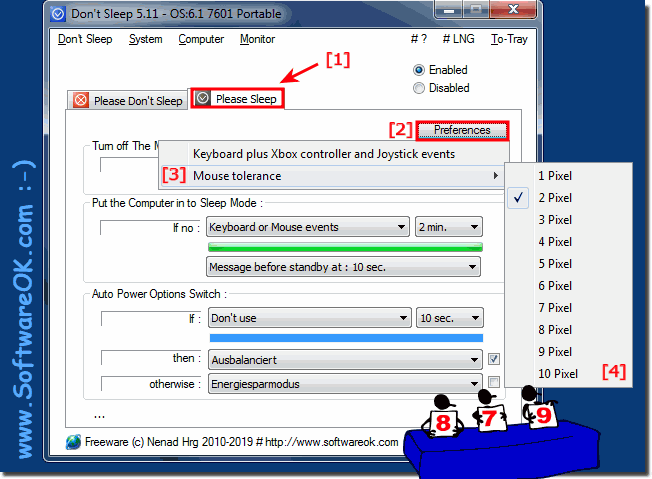 DontSleep - FAQ-11: For what Please Sleep Feature in Don't Sleep (Windows 10, 8.1, 7, ...)?